From left: Emily L. Mross, Jennifer A. 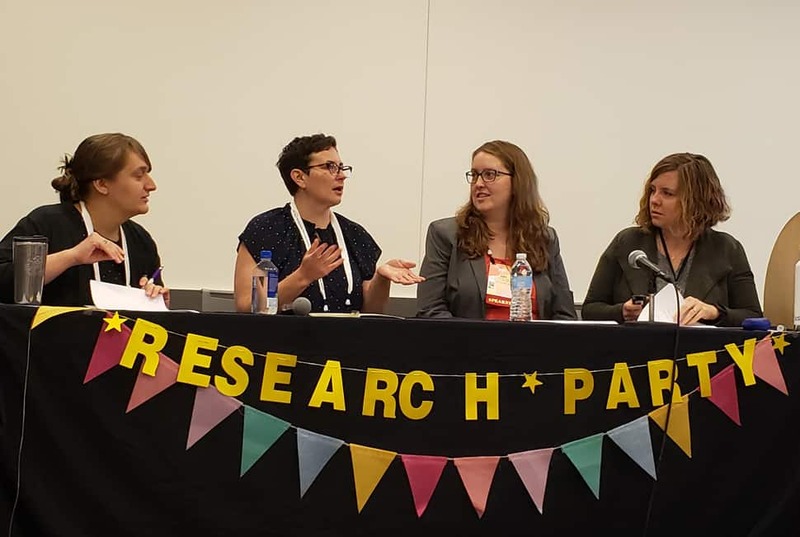 Hunter, Amy Snyder, and Christina Riehman-Murphy explain research parties at the 2019 Association of College and Research Libraries Conference in Cleveland on April 12. Three libraries in Pennsylvania are hosting research parties to help students with their study projects and papers. 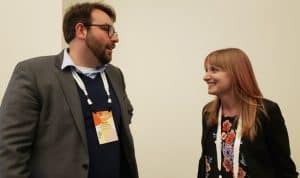 The informal setting, accompanied by pizza or snacks, offers a better way for students to get to know their librarians than what many of them see as intimidating, formal interactions at the reference desk. 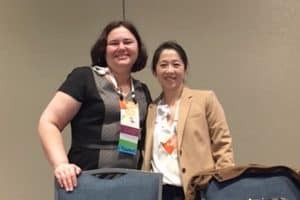 An April 12 panel session at the 2019 Association of College and Research Libraries Conference in Cleveland presented many ideas for rebranding traditional reference and setting it in a social, approachable context. Emily L. Mross, business librarian at Penn State Harrisburg (PSH), defined a research party as a venue where students can drop in and talk informally about problems they are facing with their assignments, ranging from finding the best materials to figuring out how to cite sources in American Psychological Association style. “Basically, you give them a snack,” she said, “and a boost to get through the next assignment. 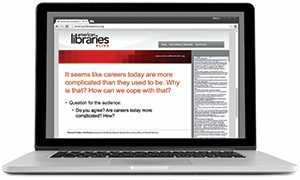 It shows students that it can be fun to get help and allows the librarians to forge closer relationships with them. 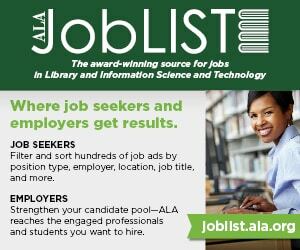 Students also come to see themselves as part of the research community and less isolated.” The librarians always hand out some kind of party favor—a pen, pencil, or water bottle—accompanied by their business cards. 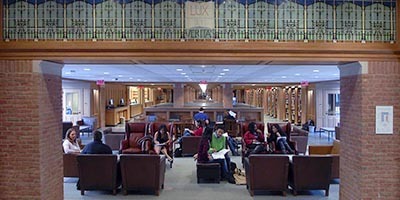 PSH hosts a research party once a semester right before finals in a 36-seat computer area that lets students consult online resources right after hearing about them. Christina Riehman-Murphy, reference and instruction librarian at Penn State Abington (PSA), holds research parties two or three times a semester. “Our attendance was only 10 at our first party,” she said. “We thought that was poor at first, but then we realized that if this had been at a reference desk, it would definitely count as a success. We held a total of 13 parties last year and reached 177 students over a period of 26 hours.” Faculty are often the best champions of these events, Riehman-Murphy said, so the library announces them through the faculty electronic mailing list. Session attendee Susan Wengler, coordinator of information literacy at Queensborough Community College in Queens, New York, said that after hearing a previous presentation on research parties by Riehman-Murphy and Hunter, she reinvented the end-of-semester student drop-in sessions her library held, making them more fun and effective. “Attendance went up 225% after jazzing them up,” she said.